material-calendarview is a better looking implementation of android's CalendarView. 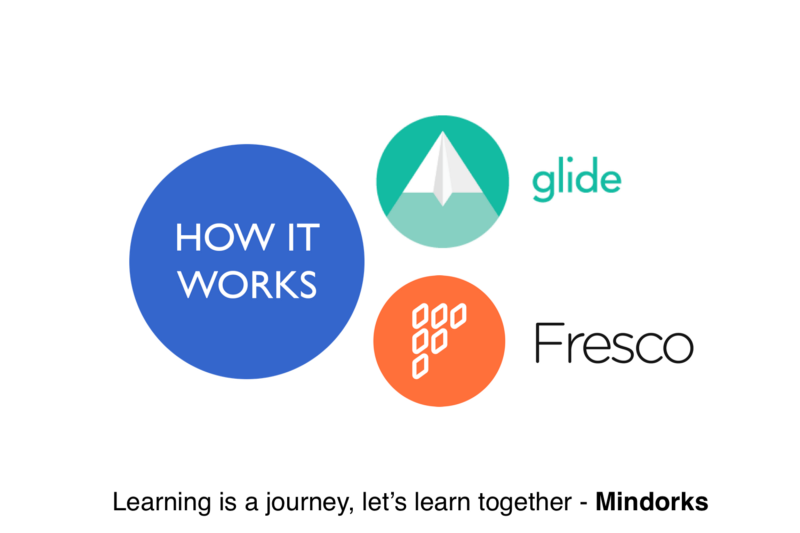 The goal is to have a more Material look and feel, rather than 100% parity with the platform's implementation. Pick a date or time on Android in style. 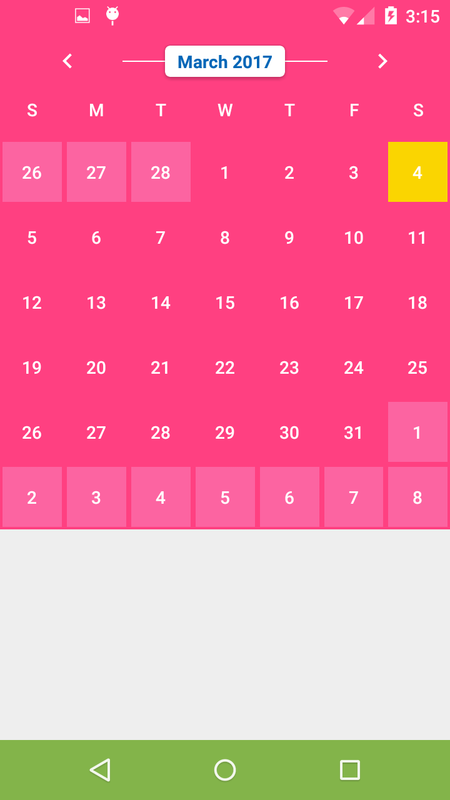 Android-Week-View is an android library to display calendars (week view or day view) within the app. It supports custom styling. 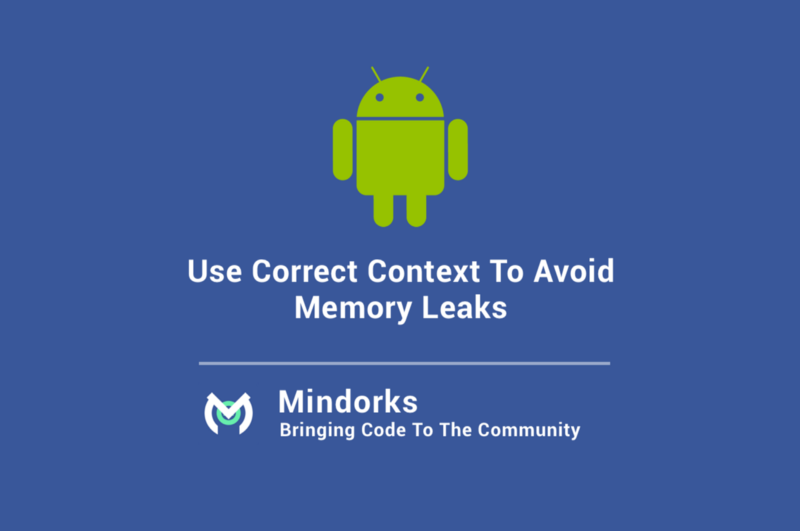 Android library for better Picker DialogFragments. A customizable view that provisions picking of a date, time & recurrence option, all from a single user-interface. Library which contains the beautiful DatePicker and TimePicker that can be seen in the new Google Agenda app. 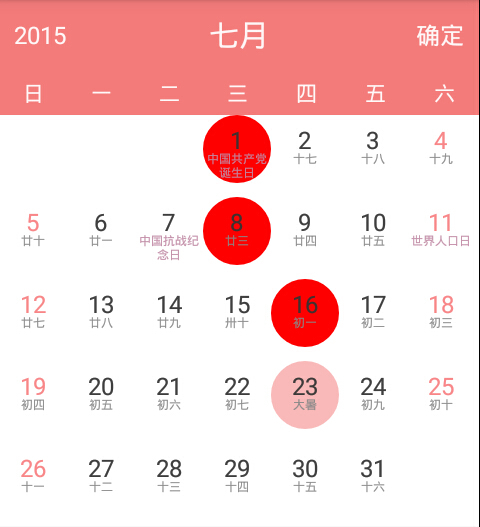 A simple date picker for android. 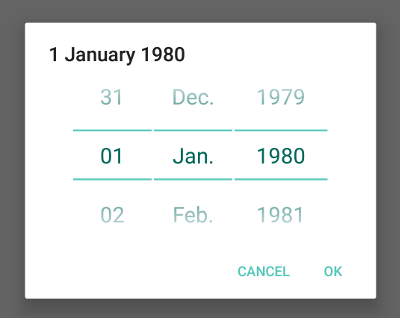 A material Date Range Picker. CosmoCalendar is a fully customizable calendar with a wide variety of features and displaying modes. 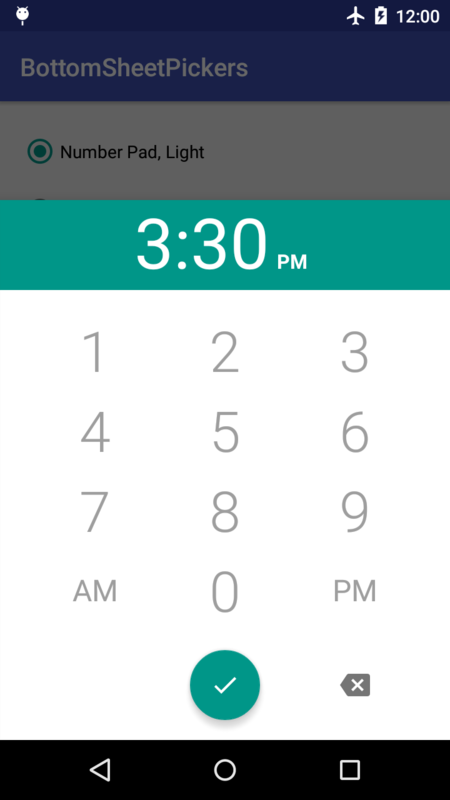 BottomSheetPickers is a set of new time pickers for Android that can be used in place of the stock time picker. 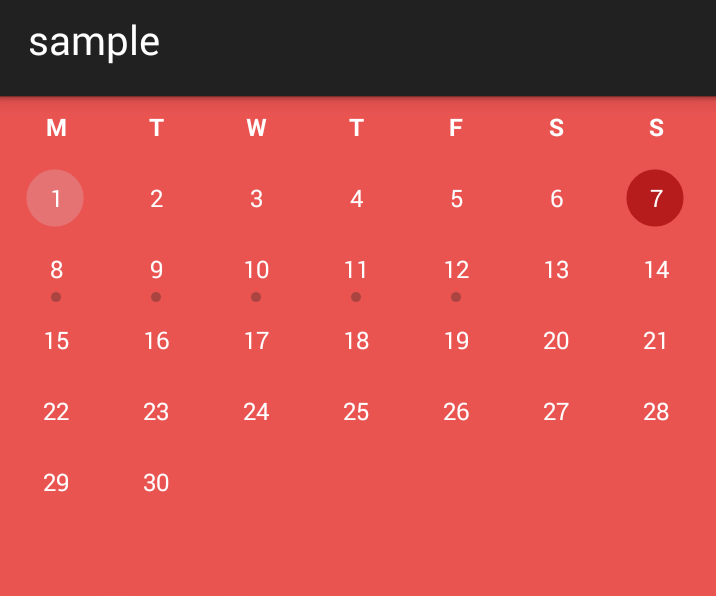 A material horizontal calendar view based on RecyclerView. SlideDateTimePicker is an Android library that displays a single DialogFragment in which the user can select a date and a time. 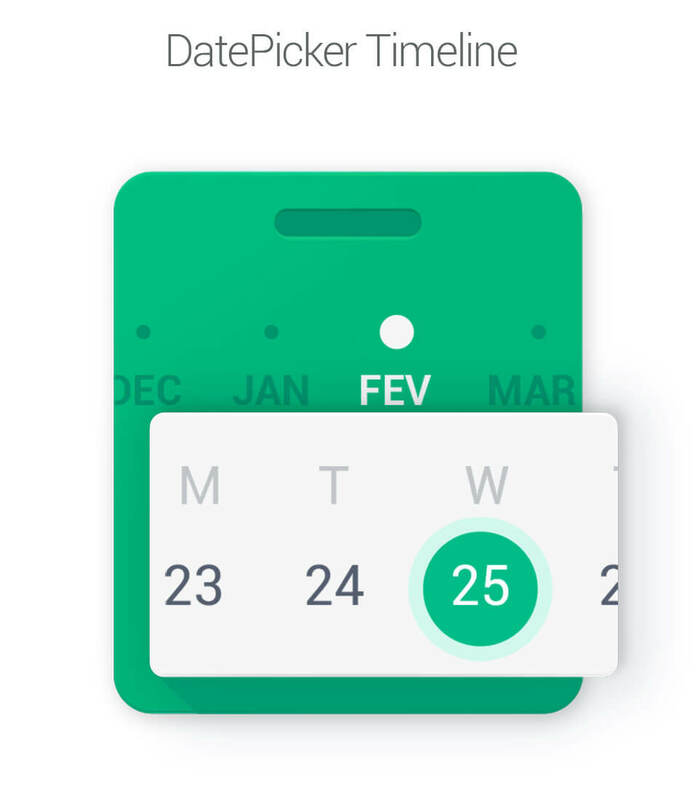 The user can swipe between the DatePicker and TimePicker, and the tab underline will gradually animate as the user swipes. The colors of the tab indicator and divider lines are customizable to fit your project's theme. You can now select a date and a time with only one widget! 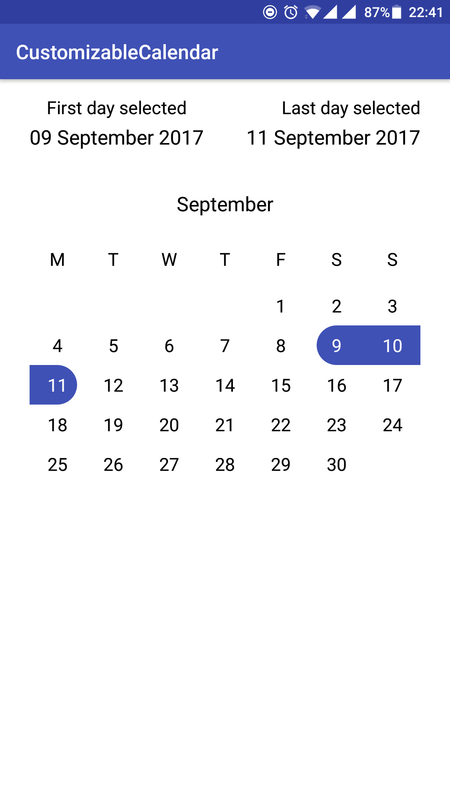 Its a Date Range Picker View with animation and improved UI. OneCalendarView is a custom CalendarView that allows android developers to have the same CalendarView in any android application (for API 16 or higher). A calendar picker. Can preset a selected day. Can customize almost all text size, color, bg color, and month title. Customizable Calendar Widget for Android. Collapsible CalendarView is a simple calendar view which can be collapsed and expanded to save space. 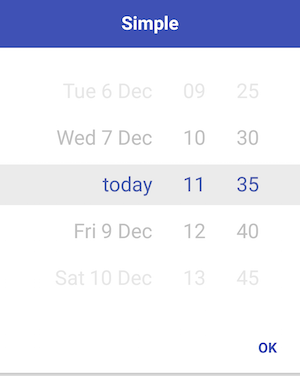 RobotoCalendarView provides an easy and customizable calendar view with native support for the Roboto fonts, includes the brand new Roboto Slab fonts. You can use this library to create your calendar, customizing UI and behaviour. The old "spinner" style DatePicker for newer Android devices. 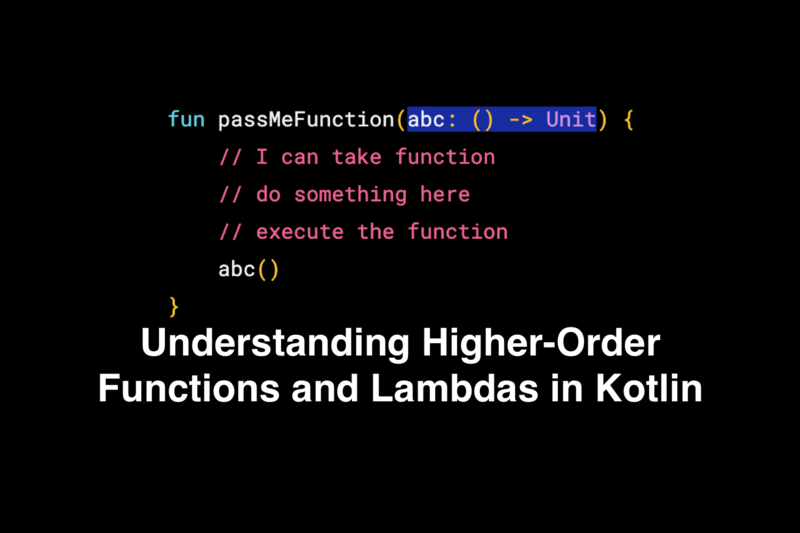 Allows styling of text and colors. Android widget to present calendar in a recycler view. The idea was to replicate calendar the way calendar is presented in the amazing Airbnb app. 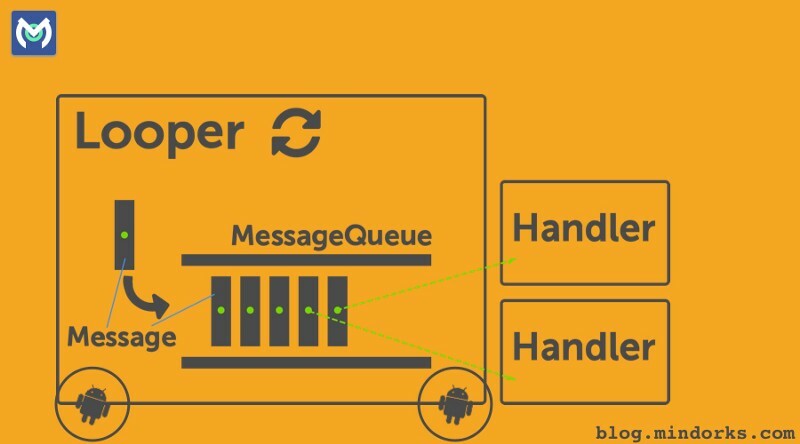 Recurrence picker dialog and view for Android. Several settings that allow you change the appearance and behavior of the view as well as styling attributes that.